A Russian soldier suspected of slaying a family in Armenia after going AWOL will be tried in Armenia. The two countries will jointly investigate the grizzly crime that provoked mass demonstrations. Valery Permyakov, who served at a Russian military base in Armenia, is suspected of murdering a family in Gyumri, Armenia’s second-largest city, on January 12. Six people were shot dead in the house while the seventh victim, a six-month-old baby boy, died days later from a stab wound. The AWOL soldier is believed to have been trying to desert. He broke into a random house to get food and went on a killing rampage after being found by the owners, according to media reports. “At a meeting in Yerevan, representatives from the Armenian and Russian investigations… agreed on a coordinated effort to conduct a comprehensive investigation,” Sona Tryzyan, spokeswoman for the Armenian Investigative Committee, announced on Tuesday. Aleksandr Bastrykin, who heads the Russian Investigative Committee, assured that both the prosecution and trial of the suspect would be held in Armenia, in accordance with international law and bilateral agreements between the two countries. The Russian official is currently visiting Armenia to tackle the fallout following the tragic incident. The high-profile crime caused uproar in Armenia and a massive rally gathered in front of the Russian Consulatelast Thursday. The protesters demanded that Permyakov be handed over and brought to justice in Armenia. The rally became violent when demonstrators started pelting police officers guarding the base with stones and other projectiles. In the ensuing clash, 26 people, most of them police officers, were injured. Permyakov was arrested the day after the massacre as he was trying to cross the border with Turkey. 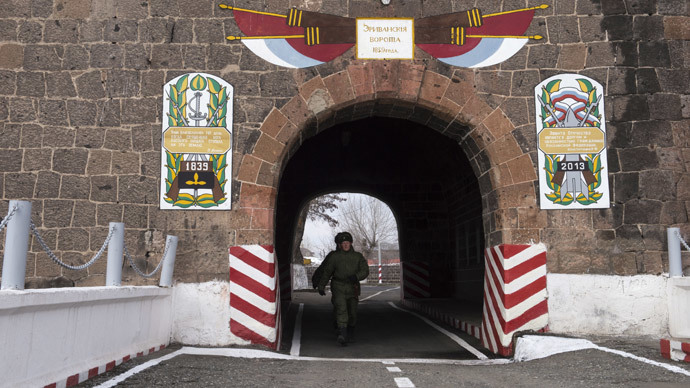 Russian border guards, who are helping their Armenian colleagues to patrol its borders, captured the man and handed him over to the base, where he is currently being held in custody.